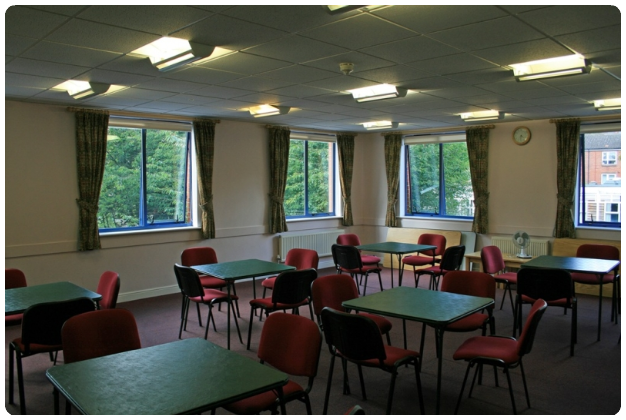 THE ACTIVITIES ROOM IS ON THE CORNER OF OUR BUILDING AT THE REAR WITH PLENTY OF NATURAL LIGHT. THIS ROOM WILL HOLD UP TO 40 PEOPLE FOR A LECTURE STYLE PRESENTAION OR UP TO 25 FOR A BOARDROOM STYLE MEETING. WHILE THERE IS NO SCREEN THERE IS AMPLE SPACE TO PROJECT DIRECTLY ONTO THE PALE PASTEL WALLS IF THIS IS REQUIRED.